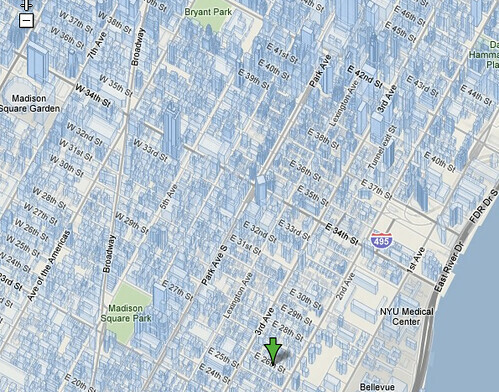 If you load up Google Maps, you may notice that they have removed the “Hybrid” button and replaced it with “Terrain.” Here is a live frame of the Google Terrain view of New York City 10010. Yes, there are plenty of other mapping services that offer these types of terrain views. I am sure someone will do a post on the alternatives and I will try to link to that post later. Gary Price posted a compilation: Sanborn Maps From Google and Historic Maps from Many Providers (Free and Fee).